(1) Suppose the energy required to remove all the three electrons from a lithium atom in the ground state is ‘E’ electron volt. What will be the energy required (in electron volt) to remove two electrons from the lithium atom in the ground state? The energy of the electron in a hydrogen like atom in the ground state is – 13.6Z2 electron volt. Therefore, after removing two electrons from the lithium (Z=3) atom, the third electron has energy equal to – 13.6×32 eV = 122.4 eV. The energy needed to remove two electrons from the lithium atom in the ground state is therefore equal to (E –122.4) eV. The angular momentum (Iω) of the electron is an integral multiple of h/2π. Therefore, Iω = nh/2π, from which, for the first orbit (n=1), ω = h/2πI = h/2πme r2 . The orbital frequency of the electron is given by f = ω/2π = h/4π2m r2 = 6.55×10-15 per second, on substituting for h, m and r.
(3) The ionisation energy of the hydrogen atom is 13.6 eV. If hydrogen atoms in the ground state absorb quanta of energy 12.75 eV, how many discrete spectral lines will be emitted as per Bohr’s theory? On absorbing 12.75 eV, the energy of the electron in the hydrogen atom will become (–13.6 + 12.75) eV which is – 0.85 eV. This is an allowed state (with n=4) for the electron, since the energy in the 4th orbit is – 13.6/n2 = – 13.6/42 = 0.85 eV. From the 4th orbit, the electron can undrego three transitions to the lower orbits (4→3, 4→2, 4→1). From the third orbit, the electron can undergo two transitions (3→2 and 2→1). The electron in the second orbit can undergo one transition (2→1). So, altogether 6 transitions are possible, giving rise to 6 discrete spectral lines [Option (d)]. You can work it out as n(n–1)/2 = 4(4–1)/2 =6. (4) The electron in a hydrogen atom makes a transition from an excited state to the ground state. Which of the following siatements is true? (a) Its kinetic energy increases and its potential and total energies decrease. (b)Its kinetic energy decreases, potential energy increases and its total energy remains the same. (c) Its kinetic and total energies decrease and its potential energy increases. (d) Its kinetic, potential and total energies decrease. This question appeared in IIT 2000 entrance test paper. The correct option is (a). You should note that the kinetic energy is positive while the potential energy and total energy are negative. Further, the kinetic energy and total energy are numerically equal and the numerical value is equal to half the potential energy. The total energy is –13.6 Z2/n2. In lower orbits (with smaller n), the potential energy is smaller since it has a larger negative value. The total energy also is therefore smaller. But, the kinetic energy is greater since it has a larger positive value. Questions of this type often appear in entrance test papers. E = –13.6 Z2/n2 eV. The energy in the first excited state (second orbit) is – 13.6×9/4 eV = – 30.6 eV. The energy to be supplied to the electron to remove it from the first excited state is therefore + 30.6 eV [Option (b)]. (d) the masses of the two nuclei are different. En = – me4/8ε0n2h2 where m is the mass of the electron, e is its charge, ε0 is the permittivity of free space and h is Planck’s constant. μ = Mme/(M+me), M and me being the masses of the nucleus and the electron respectively. [Generally, for a hydrogen like system with proton number Z, the expression for energy is En = – μ Z2e4/8ε0n2h2 ]. The nucleus of deuterium contains a proton and a neutron and has very nearly twice the mass of the hydrogen nucleus (proton). So, the reduced mass and the energy levels of deuterium are slightly greater than those of hydrogen and this is the reason for the difference in wave length. [The wave lengths are slightly shorter].The correct option is (d). An important point you should remember in the light of the above discussion is the drastic change in the energy levels and the spectrum of positronium compared to hydrogen. Positronium is a highly unstable neutral atom with an electron revolving round a positron. [ You can as well say, a positron revolving round an electron!]. The concept of reduced mass is absolutely necessary in this case since the positron has the same mass as that of the electron so that the reduced mass of positronium is mm/(m+m) = m/2 where ‘m’ is the mass of positron as well as the electron. The expression for energy of positronium is En = – μ e4/8ε0n2h2 where μ is the reduced mass of positron and electron, given by μ = mm/(m+m) = m/2. Therefore, the mass of the electron (m) used in the expression for the energy of a hydrogen atom (Bohr’s theory) is to be replaced by m/2. All energy levels are therefore reduced to half of the hydrogen levels. Since the energies for states n=4 and n=2 for hydrogen are –13.6/16 eV(= –0.85 eV) and –13.6/4 eV (= –3.4 eV) respectively, the energy of the photon emitted in the case of hydrogen is [(–0.85) – (–3.4)] eV = 2.55 eV. In the case of positronium, the energy will be half of this. So, the answer is 2.55/2 eV = 1.275 eV. Many of you might have already noted that the posts here are useful for preparing for the GRE Physics Test which consists of about 100 multiple choice questions with 5 options. The needs of the GRE Physics Test takers will be considered while discussing questions here. You may make use of the facility for comments for communications in this context. [The well known radioactive decay law is, N = N0e-λt where N0 is the initial number of nuclei, N is the number remaining undecayed after time ‘t’ and λ is the decay constant. This equation, modified in terms of half life can be written as N = N0/2n where N is number of nuclei remaining undecayed after ‘n’ half life periods. Since the activity, A = dN/dt = -λN, it follows that the activity also can be expressed in the same manner as we express N. Therfore, A = A0/2n]. Therefore, we have, 6.25 = 100/2n, taking initial activity as 100. This yields n = 4, which means that 4 half lives have been elapsed to reduce the activity to 6.25% of the initial activity. The time required is therefore 4T, given in option (b). We have, N = N0/2n so that 1.25 = 10/2n, from which 2n = 8 and n = 3. So, 3 half life periods is 6 hours so that the half life of the sample is 2 hours. Mean life, T = 1/λ = Thalf /0.693 = 2/0.693 [Option (b)]. Using the relation, N = N0/2n where ‘n’ is the number of half life periods in which the sample decays from N0 to N, we have, 10 = 100/2n. From this, 2n = 10. Taking logarithms, n log 2 = log 10. You can work this out even if you don’t have a calculator or logarithm tables since you definitely remember that log 2 is 0.3010. Therfore, n = 1/0.3010 = 3.32. So you require 3.32 half lives or, 3.32×3.02 days = 10 days for the sample to decay to 10%. The mass of a nucleus is directly proportional to the number (A) of the nucleons. The volume of the nucleus is (4/3)πR3 where R is the nuclear radius. But, R = 1.1×10-15A⅓. So, the volume of the nucleus also is directly proportional to the nucleon number A. Since density is the ratio of mass to volume, it follows that the density of nuclear matter is independent of the nucleon number A. Volume of nucleus = (4/3)πR3 where R is the nuclear radius. d = (1.67×10-27×A) /[(4/3)π×(1.1×10-15 × A⅓)3. This works out to approximately 3×1017 kg/m3. Since the momenta of the parts have to be equal in magnitude in accordance with the law of consevation of momentum, we have, m1v1 = m2v2 so that m1 /m2 = v2/v1 =1/2. The masses being directly proportional to the volumes, and the volumes being directly proportional to the cube of the radii, the radii (sizes) are directly proportional to the cube root of the masses. So, the answer is 1:2⅓. Suppose a radioactve mother nucleus emits a β-particle. Are the mother and daughter nuclei isotones or isobars? When a nucleus emits a β-particle, a neutron in the nucleus becomes a proton and hence the neutron number is changed. So the mother and daughter are not isotones. The mass number is not changed but the proton number (atomic number) is changed. So they are isobars. Note that becquerel (Bq) is the unit of radioactivity in SI and is equal to one disintegration per second. Number of nuclei (or, atoms) in 2 gram of radium is (2/226)×NA = (2/226)×6.025×1023 = 5.33×1021. [NA is the Avogadro number, 6.025×1023]. Activity = λN = (0.693/Thalf)×N = [0.693/(1620×3.16×107)] × (5.33×1021). Note that we have converted the half life in years into seconds. [ 1 year = 325.25×24×60×60 seconds = 3.16×107 s]. The activity works out to 7.2×1010 becquerel. How much mass has to be converted into energy to produce electric power of 100 MW for one hour? (Assume that the conversion efficiency is 100%). [We have converted megawatt into watts and hour into seconds]. m = (3.6×1011)/(3×108)2 = 4×10-6 kg = 4 mg.
m = m0/√[1- v2/c2] so that when v = c/2, m = m0/√[1- ¼] = 2m0/√3. The momentum of the proton is mc/2 = m0c/√3. Questions in Electronics are simple at the Higher Secondary/Plus two level. Many of you might be interested in Electronics and your attitude towards this subject will make it seem to be simpler! The correct option is (c). On raising the temperature of a semiconductor, more charge carriers are produced by the breaking of the covalent bonds, unlike in the case of a metal. Therefore, as you might have noted, semiconductors have negative temperature coefficient of resistance. Since 98% of the electrons reach the collector, the collector current is 98% of the emitter current and the base current is 2% of the emitter current. As the collector current is nearly equal to the emitter current, the base current is 2% of the collector current. Therefore, base current = 20×2/100 = 0.4 mA [Option (d)]. We have ∆IB = ∆IE-∆IC where ∆IB, ∆IE and ∆IC represent the changes in the base current, emitter current and the collector current respectively. Since α = ∆IC/∆IE, we have, ∆IC = α∆IE = 0.995 ×10 = 9.95 mA. In the circuit, the supply voltage used is 12 volts and half of it (6V) should appear between the collector and emitter. The remaining half (6V) should appear across the 3 kΩ collector load resistor, on account of the collector current flowing through it. Therefore, collector current, IC = 6V/3kΩ = 2 mA. [Note that we have substituted the resistance in kilo ohm itself to obtain the collector current in milliampere]. We have IB = IC/β = 2 mA/400 = 0.005 mA = 5 μA. Therefore, 5 μA should flow through the base biasing resistor RB. Since the base to emitter voltage drop is allowed to be neglected in the question, the voltage across RB is the full supply voltage, 12V. [If you cannot neglect the base to emitter voltage, you will have 11.3 volts instead, in the case of a silicon transistor, since you will have to subtract the forward voltage of 0.7 volts].Therefore, RB = 12V/5μA = 2.4 MΩ [Option (a)]. [Note that we substituted the current in microampere itself to obtain the resistance in megohm (mega ohm). Now, what is the function of the capacitors on the input side and the output side of the amplifier circuit shown above? Note that they are meant for preventing the direct biasing voltages from reaching the signal source and the load and for allowing the varying signal voltages to pass through. 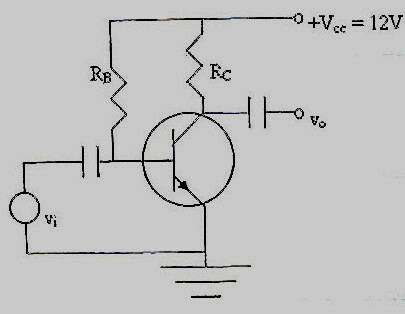 In a common emitter amplifier circuit drawing a quiescent collector current of 1 mA, the input resistance of the transistor is 1.2 kΩ and the collector load resistance is 3 kΩ. If the common emitter current gain of the transistor is 400, what is the voltage gain of the amplifier? The quiescent collector current of 1 mA given in this question is just a distraction. The voltage gain (or, voltage amplification, Av) of a common emitter amplifier is given by Av = βRL/Ri where RL is the load resistance and Ri is the input resistance of the amplifier. Therefore, voltage gain = 400×3/1.2 = 1000. [Note that we have substituted the resistance value in kilohm (kilo ohm) itself since we have a ratio of resistances in the expression]. We have, β = α/(1- α). Therefore, the given ratio, (β – α)/αβ = [α/(1- α) – α]/αβ = [1/(1- α) -1]/β = [1-(1- α)]/(1-α)β = α/(1- α)β = β/β =1. Therefore, the correct option is (b). This is a very simple question based on the law of mass action, NeNh = Ni2 , where Ne and Nh are the number densities (number per unit volume) of the electrons and holes respectively in the doped semiconductor and Ni is the number density of electrons as well as holes in the intrinsic (pure) semiconductor. Therefore, Ne = Ni2/Nh = (9×1032)/(4.5×1022) = 2×1010 m-3. The current gain of the transistor used, in the common emitter configuration is β = ∆IC/∆IB = (1000 μA)/(15 μA) = 1000/15. [Note that we have converted the collector current into micro ampere since the base current is in micro ampere]. The voltage gain of the amplifier is βRL /Ri = (1000/15) ×(5000/333) = 1001. (d) there is an electric field at the junction directed from the p-type side to the n-type side. Even if no voltages are applied to a junction diode, the n-side is at a higher potential (of a few hundred millivolts, the exact value depending on the type of the semiconductor) compared to the p-side. This results due to the diffusion of electrons from the n-side to the p-side and similarly, the diffusion of holes from the p-side to the n-side. The n-side is therefore left with a net positive charge and the p-side is left with a net negative charge. This inherent reverse bias across the junction therefore produces an inherent electric field at the junction, directed from the n-type side to the p-type side[Option (c)]. On substituting for ‘m’ and ‘r’, moment of inertia = (3/2) Lρ×L2/ 4π2 = 3ρL3/8π2, given in option(a). The correct option, as you might be knowing, is (e). Occasional simple questions like this will help you in saving your time for spending on other difficult questions. Good question setters will usually include a few simple questions for boosting your morale! Mgh = ½ Iω2 + ½ Mv2 where M is the mass, ‘v’ is the linear velocity, I is the moment of inertia and ‘ω’ is the angular velocity of the cylinder. Mgh = ½ ×(½ MR2) ω2 + ½ Mω2R2, which yields R = √[4gh/3ω2] = √5, on substituting for g,h and ω. If you remember that the acceleration of a body rolling down an incline of angle θ is (gsinθ)/[1+ (k2/R2), where ‘k’ is the radius of gyration and R is the radius of the rolling body, you will be able to solve this in one minute. The radius of gyration of a solid sphere about its diameter is (2/5)R2 since its moment of inertia, I = (2/5)MR2, which can be equated to Mk2. Therefore, k2/R2 = 2/5 for a solid sphere. Its acceleration = (g sin30˚)/[1+(2/5)] = (10×½)/(7/5) = 25/ 7. We have s = ut + ½ at2 = 0 + ½ ×(25/7) ×7 = 12.5 m [Option (c)]. You will find more multiple choice questions (with solution) on rotational motion here. The glass bead can displace more water when it is resting on the wooden block since a floating body will displace a volume of liquid having the weight of the floating body. Inside the water, it can displace water having its own volume only. This volume is less since the density of glass is greater than that of water. Therefore, ‘h’ is decreased on transferring the glass bead to the water in the beaker. The extent (d) to which the wooden block is within water also is decreased since the weight of the glass bead is relieved from the block. So, the correct option is (e). (2) A tank is filled with water up to height ‘H’. A hole is made on the side of the tank at a distance ‘h’ below the level of water. What will be the horizontal range of the water jet? The water jet at the hole on the side of the tank will be directed horizontally with a velocity (of efflux) equal to √(2gh), as given by Torricelli’s theorem. The vertical fall of the jet is through the distance (H-h) and the time of fall (t) is √[2(H-h)/g], given by the equation of linear motion, H-h = 0 + ½ gt2. The horizontal range R = Horizontal velocity × Time = √(2gh) ×√[2(H-h)/g] = 2√[h(H-h)]. So, the correct option is (c). [ It is interesting to note that this is independent of g so that the range on the moon will be the same as that on the earth for given values of H and h]. By putting dR/dh equal to zero, you can show that the horizontal range ‘R’ is maximum when h = H/2, which means that the hole should be at the middle of the water column. The work done in obtaining a cylindrical liquid column of height ‘h’ and cross section area ‘A’ is ½Aρgh2 and this is stored as potential energy in the liquid column. [ You can easily obtain this by integrating Aρgxdx between limits 0 and h. Note that (Adxρg) is the weight of liquid column (slice) of small height dx and hence (Adxρg)x is the work done against gravity to lift this liquid slice through a height x. The total work done is the integral between the limits 0 and h]. [Alternatively, you can get it by arguing that the weight of the entire liquid column is Ahρg and its centre of gravity has been raised through a height h/2 so that the work done against gravity is Ahρg(h/2), which is equal to ½Aρgh2]. The work done by gravity on equalizing the levels in the cylinders is the difference between the initial and final potential energies of the two liquid columns. Therefore, work done = (½Aρgh12 + ½Aρgh22) - 2×½Aρg [(h1+ h2)/2]2. Note that finally the two liquid columns have the same height [(h1+ h2)/2]. The above expression for work done simplifies to (¼)Aρg(h1 - h2)2 given in option (e). This simple question involves the application of Boyle’s law: P1V1 = P2V2 with usual notations. The initial pressure is the total pressure due to the atmosphere and the water column of height ‘h’ in the lake. So, the initial pressure of the bubble is equivalent to that due to water column of height H+h. If the initial volume is V, the final volume is 8V since the radius of the bubble is doubled. The final pressure is the atmospheric pressure ‘H’. (H+h)V = H×8V, from which h = 7H [Option (c)]. You will find more questions (with solution) on properties of fluids here as well as here. The Information Bulletin and the Application form can be obtained by post from the Joint Secretary (AIEEE), Central Board of secondary Education, 17, Rouse Avenue, Institutioal Area (Near Bal Bhavan), New Delhi-110002. The cost of Information Bulletin containing the Application Form, inclusive of the examination fee for BE/B.Tech. only or B.Arch/B.Planning only is Rs.300/- and Rs.150/- for General and SC/ST candidates respectively. Candidates appearing for both BE/B.Tech and B.Arch/B.Planning together should send their application form along with additional fee in the form of Demand Draft of Rs.200/- for General and Rs.100/- for SC/ST candidates in favour of Secretary, CBSE, payable at Delhi/New Delhi. To obtain Information Bulletin containing Application Form by post, candidates should send their request to The Joint Secretary (AIEEE), Central Board of Secondary Education, 17, Rouse Avenue, Institutional Area (Near Bal Bhavan), New Delhi-110002, along with a bank draft of Rs.350/- for General Category and Rs.200/- for SC/ST candidates in favour of The Secretary, CBSE, payable at Delhi/New Delhi and a self addressed envelope of 12”×10”. By visiting the site www.aieee.nic.in complete information in this regard can be obtained. Make it a point to visit the site to be informed of information updates. Details of ‘Online’ application and extra information for candidates opting for examination centres in foreign countries also can be obtained from the site.